Generally, tests aren't needed in order to diagnose hot flashes, as they are characteristic of causing a rapid heartbeat, perspiration, flushed, blotchy skin, and a sudden feeling of warmth across the upper body and face. Nevertheless, the following signs of hot flashes will help you pinpoint the symptom. Read on for more. A follicle-stimulating hormone (FSH) that is consistently higher than 30 mIU/mL is a good indicator that a woman is in perimenopause and about to enter menopause, signifying the occurrence of symptoms such as hot flashes. Nevertheless, one high FSH reading is not enough to confirm perimenopause. It is wise to confirm with further testing as well. When the ovaries' reproductive abilities begin to decline mid-life, so does the amount of estrogen they produce as they are the main manufacturers of the hormone throughout women's fertile lives. Accordingly, low levels of estrogen are generally a worthy sign of hot flashes as well as other infamous symptoms, such as night sweats, vaginal dryness, mood swings, and more. Low thyroid-stimulating hormone (TSH) levels in lieu of abnormal T3 and T4 levels signify hypothyroidism, which is when thyroid gland is failing due to an underlying problem. It is common for an underactive thyroid to exhibit symptoms similar to those of menopause, such as hot flashes. Speak with your doctor about appropriate tests to take based on your specific symptoms exhibited. Each woman's case will vary. 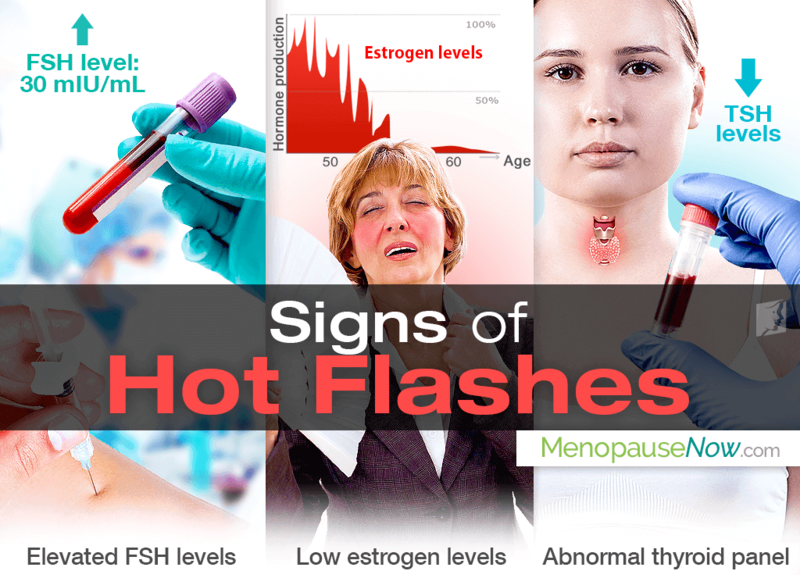 All in all, signs of hot flashes are results of tests proving elevated FSH levels, low estrogen levels, or an abnormal thyroid panel alongside the reporting of further menopause symptoms. Once a woman diagnoses her hot flashes, she would do well with pursuing natural and effective hot flash treatments to keep them and other symptoms at bay. The key to ultimate relief and reprieve from bothersome hot flashes begins and ends with you! Heart Flash: What's Going On? Some women experience sharp electric shock sensation before a hot flash. Read on to learn more uncommon symptoms of hot flashes. Sweating and disrupted breathing patterns are just some of the ways hot flashes can affect you. Educate yourself about what may happen.